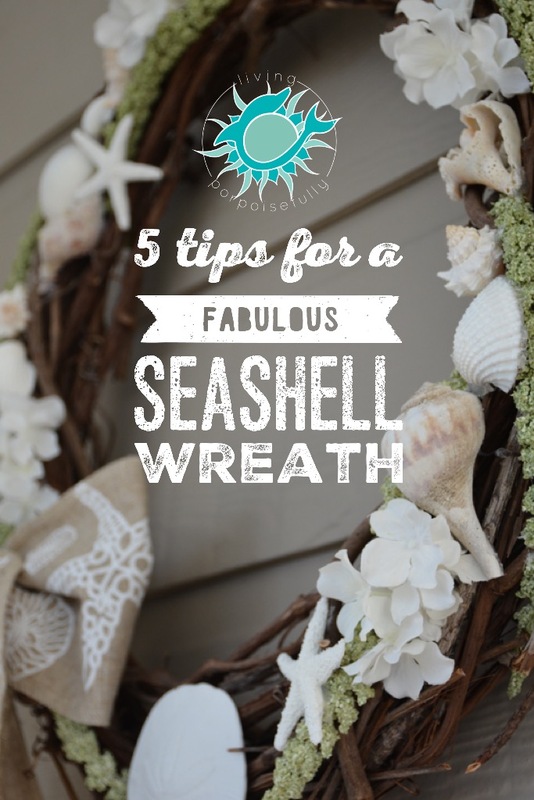 A seashell wreath is a fun way to bring the playful beach spirit home. Do you ever get that feeling when there’s a cold spell, like “C’mon spring — hurry up and get here!”? Not that I don’t enjoy the cozy experiences that colder weather has, but sometimes you’re just ready for the next season to arrive, right? So, I’ve decided to take matters into my own hands and encourage spring to arrive with the creation of a spring seashell wreath. I’m not sure if it will make those oh-so-perfect temperatures come any sooner, but it certainly is giving me that springtime vibe. I hope it will do the same for you, and inspire you to make your own creation! And, to help you embark on your wreath-making adventures, I’m also sharing five tips for how to get your creative juices flowing. Enjoy! 1. Coordinate your color palette to get a simple, yet abundant feel. Gather your favorite seashells and florals in colors that reflect one another. Choose a few kinds of similar-looking seashells in soft neutrals; faux starfish & sand dollar, clam shells, and bunchy florals in whites; along with an accent floral color (I chose green). You can make a bow or purchase one already made that reflects the color palette. For the wreath itself, I used a vine wreath, which gives a nice contrast to the whites and neutrals. 2. Position your bow or other central features to help balance the rest. Once you’ve set these down first, say a sand dollar at the top center, or the bow in the lower left hand corner, this will help you visually balance it with your other groupings. It’s not glued down yet, so try them in different spots to see how you like it! 3.Play, play, PLAY with your design! This is where the fun is. It usually takes a bit for me to “get out of my head” and warm up to the creative play of arranging and grouping. Add more seashells or flowers, take them away, go over-the-top just to try it out, or go super-minimal. There’s no shame here – you can play all you want because you don’t need to make anything permanent until you absolutely love it. 4. Take a picture of it. Sometimes taking a picture of the wreath and viewing it on the camera screen can give you a better visual sense of how it looks. You might see gaps that you didn’t see before, or areas that you want to rearrange. 5. Leave it for a little, then come back to see if you love it. Once you do, then glue down each piece. Once you’ve gotten everything arranged to your liking (or even in the middle of it), walk away for awhile and do something else. Then come back and ask yourself if you love it. If not, rearrange until you absolutely do. I came back to mine after a couple days and had new sparks of creativity that weren’t there originally. I also like to get my better half to weigh in on it too, once I’ve got it close. We hope this post inspires you to embrace wreath-making as a fun, playful adventure! Once your wreath has been made with love and hung proudly on your door, those good vibes will keep bouncing back to you and those that come to your door all throughout the season.